A child was born to the hunter-chief Nagan ,at Uduppur in Potthappi Nadu, after a long time .He was very heavy — so, they named him Tinnanar.Tinnanar was educated according to the hunter’s customs. He became a good archer. When Tinnan entered the dense parts of the forest, he hunted zestfully along with his friends. One of the pigs caught by them escaped and Tinnan pursued it along with his friends Nannan and Kadan and killed it. They found themselves near a hill. Nannan told Tinnan that this was the hill of Srikalahasti with a temple to Lord Shiva. On hearing this Tinnan was earger to see the temple. All the three went up the hill . As he saw the Lord there, he felt supreme love surging in his heart. The moment Tinnan’s eyes saw the Shiva’s Linga,he felt supreme love evolving for the lord in his heart. Tannanar felt that the Lord was lonely there, and that he should thenceforth remain with Him.He gave up the idea of returning home. Again, he thought that the Lord might be hungry. He quickly came down the hill to fetch some food for the Lord. He took the best pieces of the pork, tasted them and kept the very best for Him. The Lord was worshipped daily with water, flowers, etc, before the food was offered to Him. So, he began to collect the other articles of worship. He filled his own mouth with water from the river. He gathered some flowers and wore them on his head! He took the pork, bow and arrow and went up the hill again, alone this time. 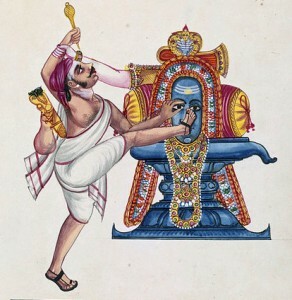 For five days Tinnan continued his unconventional worship which included cleaning the top of the Linga with his feet wearing the sandals without knowing that he should remove the footwear before doing such holy deeds. Meanwhile the regular priest of the temple got annoyed by the presence of meat and unconventional things in the premises of the temple. It took sometime before the regular priest (Sivagochariar) discovered the devotee was Tinnan who was performing the desecrator worship.The Sivagochariar was greatly upset about the desecration of the holy place. On the sixth day when Tinnan came with flowers on his head and cooked meat in his hands to perform his usual worship, he was grieved to see one of the eyes of Shiva spouting blood.He wept bitterly. He fell down fainted and stood up and wiped the blood which did not stop. He ran into the forest and brought medicinal plants and squeezed the essence on the bleeding eye but in vain. A simple idea occurred to him: ‘flesh for flesh’. At once, with his own arrow, he took out his own right eye, and fixed it over the right eye of the Lord.The bleeding stopped. But Tinnan’s joy at having stanched the flow was short-lived. Presently, the second eye of the Ling began spouting blood. Tinnan did not worry because he already had remedy at hand.There was only one problem — how to locate the left eye of the Lord, when his own eye had been pulled out. So, he placed his foot on Shiva’s bleeding left eye and pulled out his own healthy eye with his arrow and stick it to the Lord. At once, The Lord’s hand stretched from the Shivalinga and stopped the hunters hand hastily and commanded, “My dear child, Kannappa! Stop plucking your eye.” The Lord repeated the word Kannappa thrice. Kannappar was thrice blessed.Thus the hunter Tinnan got the worthy name of Kannappar, meaning one who has stuck his eye. Kannappar regained his vision and lived as god himself. This must be the oldest eye-donation in the history of mankind.This was the highest peak of devotion which immediately reveals the Lord in all His glory. Such is the enthralling story of the hunter Kannappar.